My preference is to think of spirituality as being grounded in this world and this life, not in a concept of a world and life beyond the here and now. And it has three dimensions: the spirituality of self, the spirituality of relationships, and the spirituality of my relationship to the planet and the cosmos. Eckhart Tolle’s books (The Power of Now and A New Earth) are my favorite source of enlightenment about the spirituality of the self. Obviously, Susan Stiffelman, author, teacher, and therapist, has learned from Tolle, too. The introduction to was written by Tolle, and the book is an “Eckhart Tolle edition” of New World Library. What I enjoy most about Parenting with Presence is the way she puts flesh and bones on the spirituality of relationships—specifically, the relationship between parent and child. And this is the theme of her wonderful book, Parenting with Presence (2015) which coaches us in the many dimensions of parenting how to be present with your child, how to make that relationship a spiritual experience. This is not some kind of woo-woo, feel-good book. It’s a very practical, experience-based, hands-on description about how to grow and learn from parenting; how to be “real” with your child; how to teach respect, empathy, and compassion; and how to communicate with your child. It is beautifully written, with exercises and FAQs at the end of each chapter. 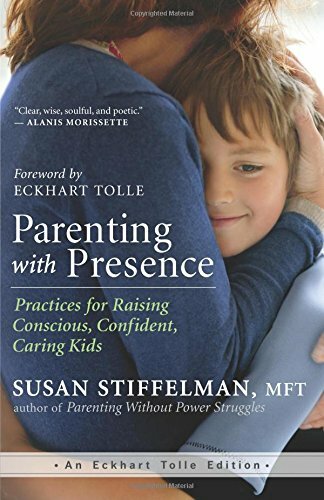 Stiffelman is also the author of Parenting without Power Struggles (2012) And now this new work is one of my favorite parenting books.